There is NO 6:15 WOD today. All other WODs are on! Forgot Someone On Your Holiday List? Check out our Stores at Zazzle and Cafe Press! This is s CrossFit Hero WOD. THANK YOU to all the men and women serving overseas this holiday season to help keep us safe! Army Captain Dan Whitten, 28, of Grimes, Iowa, assigned to the 1st Battalion, 508th Parachute Infantry Regiment, 4th Brigade Combat Team, 82nd Airborne Division, based out of Fort Bragg, NC, died February 2, 2010, when enemy forces in Zabul, Afghanistan attacked his vehicle with an improvised explosive device. 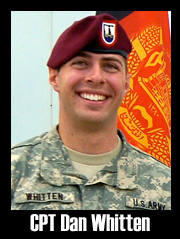 Whitten is survived by his wife, Starr Whitten, his mother, Jill Whitten, his father, Dan Whitten, and his sister, U.S. Army Captain Sarah Whitten.